“Ribbit ribbit I am a frog. As pretty as a frog can be. I love to jump from log to log. Come with me you’ll see. ~Kevin Seales, A Frog Like Me. 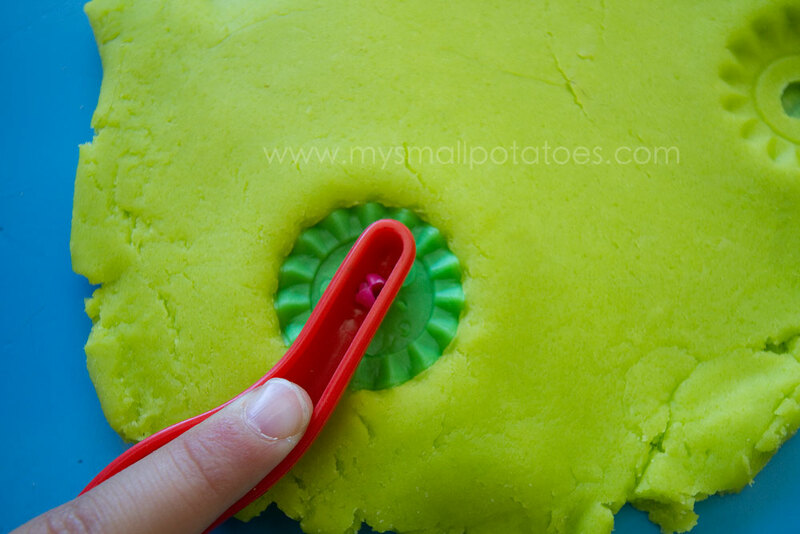 It’s been a while since we’ve played with playdough here on the blog…it’s time! 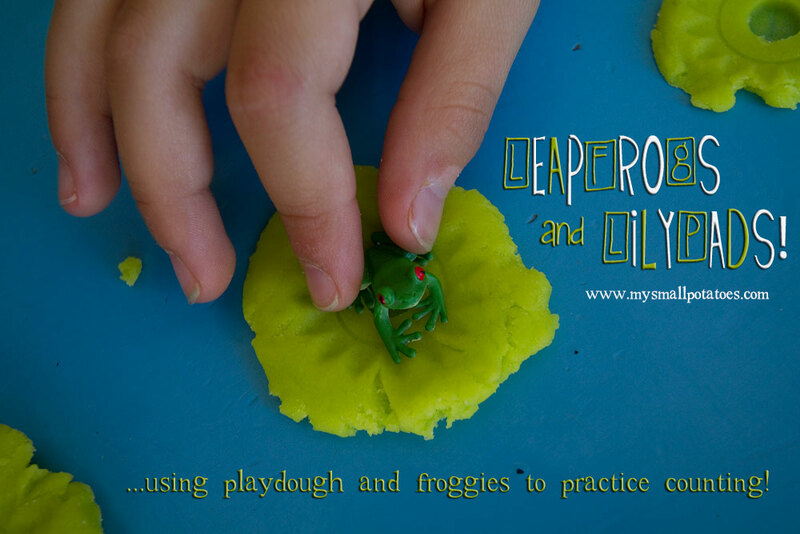 Today we took advantage of the bright blue of my kitchen table and made lily pad playdough. 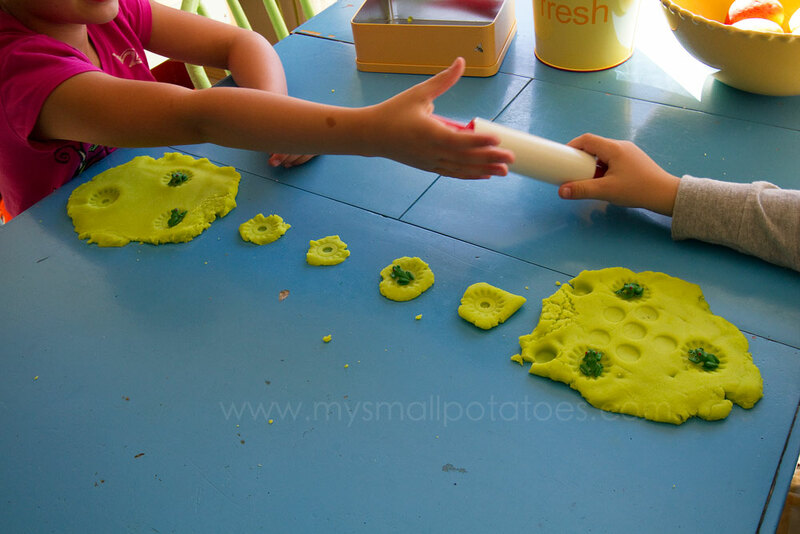 The blue table became the water, and the smalls made the lily pads using the two very simple tools I gave them…a rolling pin, and a plastic pastry cutter. 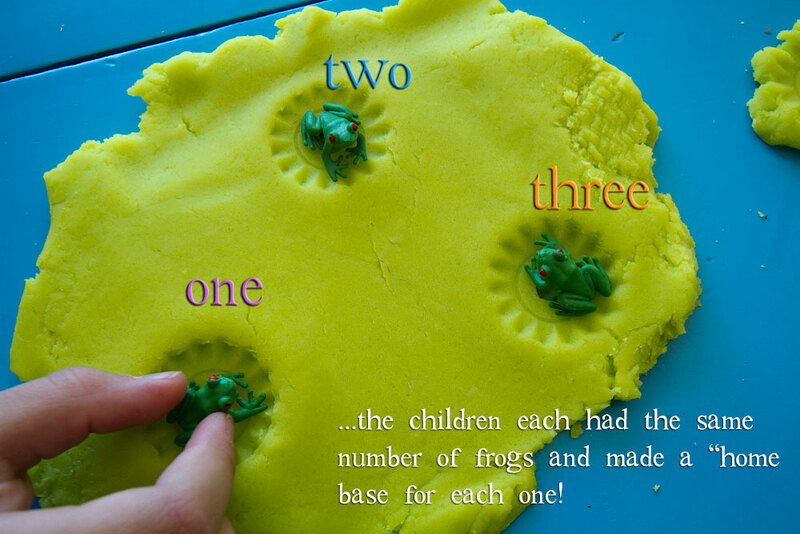 I had 2 children at this activity and so I divided the playdough into 2 big pieces and encouraged them to create a bridge of lily pads from one home base to the other, as we were going to play a counting game. I do not like to create strict rules for an activity. Children will find enough of that at school when they are older. I like to give a few guidelines and an objective, and then sit back and watch what the children will come up with. This encourages creativity and free-thinking. These two smalls got straight to work with smiles and the happy chatter of planning. 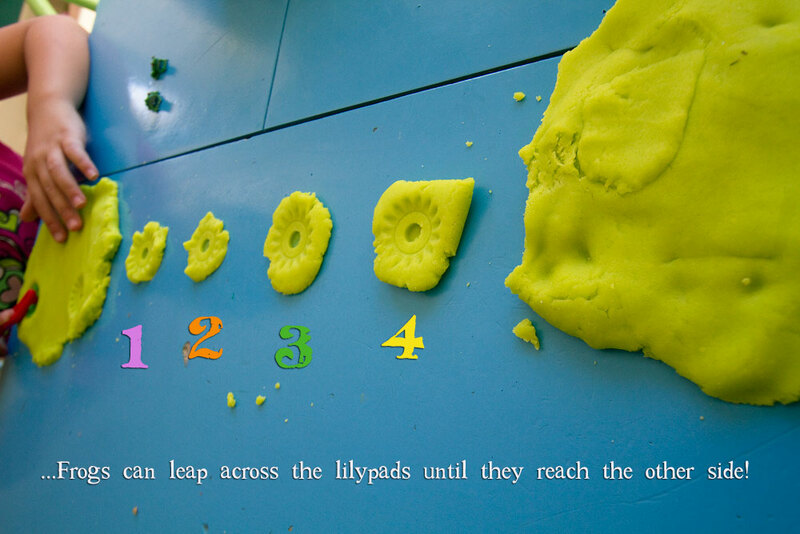 the smalls thought to use the edge of the pastry cutter as a pattern for the lily pads. Would you have though of that? I know I wouldn’t have. They passed the two tools back and forth to each other as they constructed their pond and bridge of lily pads… These two decided that 4 lily pads were just enough to cross the pond… We played many variations of this jumpy counting game. The frogs jumped forward and counted. The frogs skipped one lily pad on their way over, thus skipping that number. The frogs jumped backwards, and who knew those frogs could count backwards so well? We made more lily pads for the frogs and they jumped by twos and fives! The oldest small gave the younger one directions…jump forward 2 pads, jump back 3, and then jump ahead 5! then the younger one took his turn in giving directions. 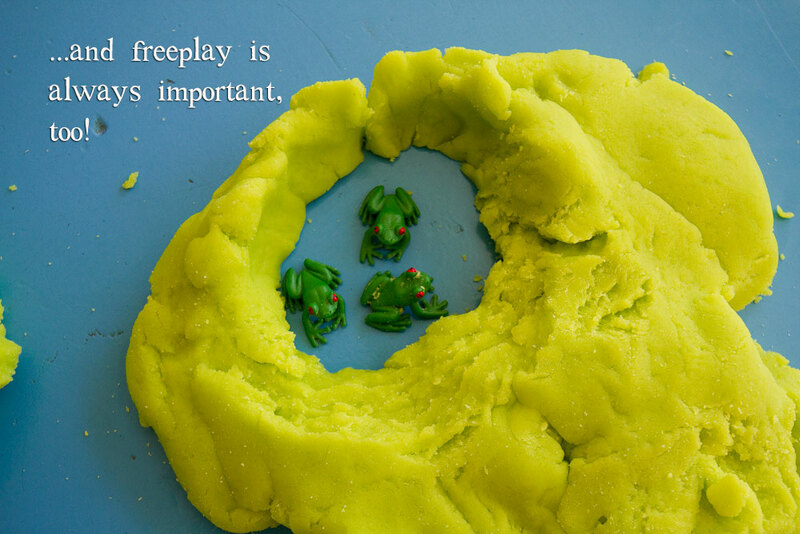 So many ways to play with a bit of flour and water and a few frogs! 1 cup water, 1 Tbsp oil, food colouring, or powdered paint. *mix well, slowly cook on medium heat as you stir. It will form a big ball. Remove from heat. Knead until smooth. Love this activity. 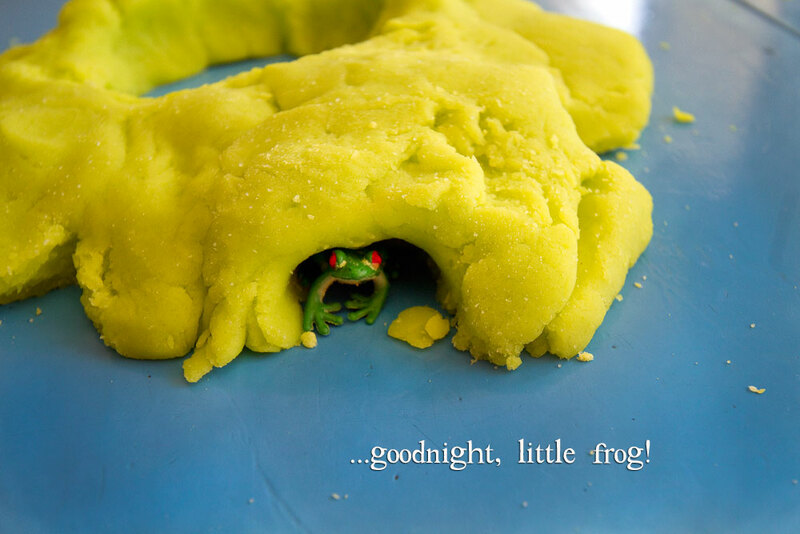 When did you find the cute frogs? 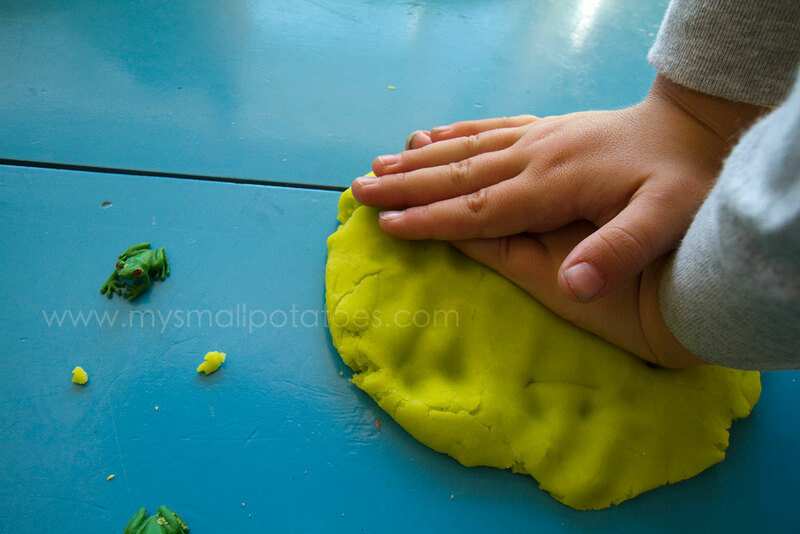 Hey, we were playing with playdough today too! It had been a quite a while since I’d made a batch! We had an ice-cream shop going on with ours. 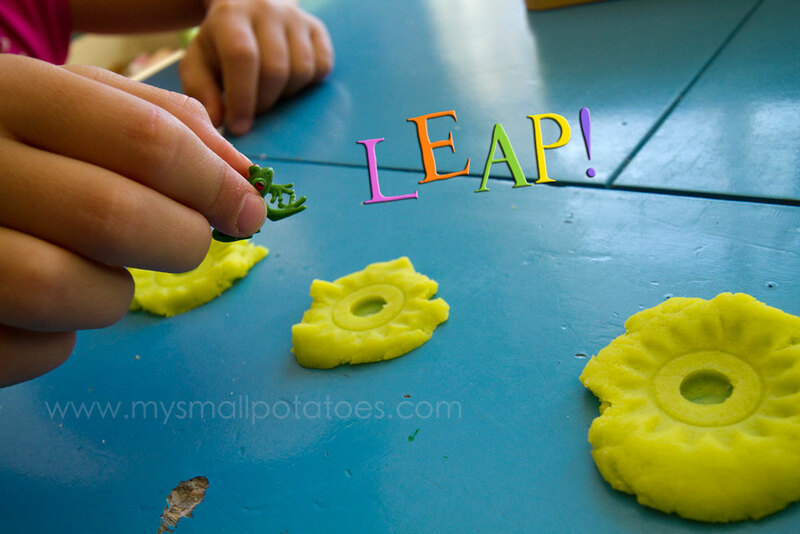 Love the green you whipped up for your lily pads! Love this! 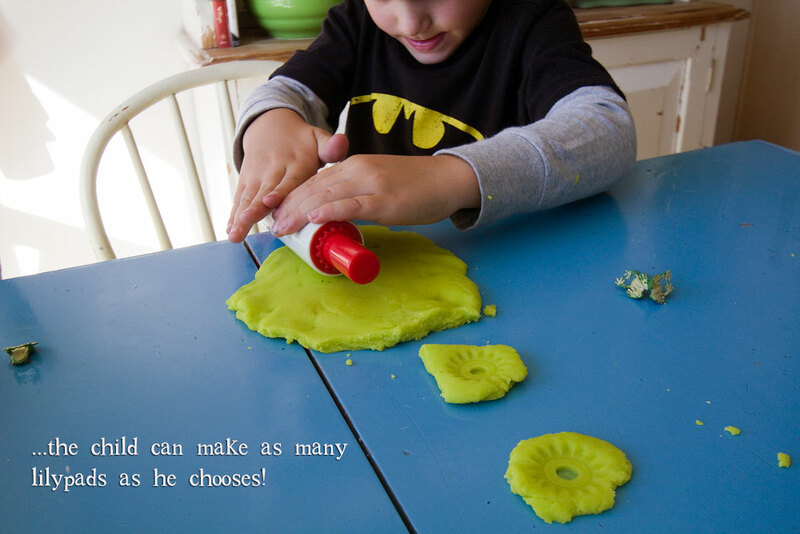 Love your son’s Batman shirt too…that’s been a BIG hit in our home lately.